Neil Alden Armstrong (5 August 1930 – 25 August 2012) was an American test pilot and astronaut, who was the commander of the Apollo 11 moon landing mission on July 20, 1969, in which he and Buzz Aldrin were the first humans to land on the moon, and he was the first man to walk on the moon. Words said when Armstrong first stepped onto the Moon (20 July 1969). In the actual sound recordings he apparently fails to say "a" before "man" and says: "That's one small step for man, one giant leap for mankind." This was generally considered by many to simply be an error of omission on his part. Armstrong long insisted he did say "a man" but that it was inaudible. Prior to new evidence supporting his claim, he stated a preference for the "a" to appear in parentheses when the quote is written. In September 2006 evidence based on new analysis of the recordings conducted by Peter Shann Ford, a computer programmer based in Sydney, Australia, whose company Control Bionics helps physically handicapped people to use their own nerve impulses to communicate through computers, indicated that Armstrong had said the missing "a". This information was presented to Armstrong and NASA on 28 September 2006 and reported in the Houston Chronicle (30 September 2006). The debate continues on the matter, as "Armstrong's 'poetic' slip on Moon" at BBC News (3 June 2009) reports that more recent analysis by linguist John Olsson and author Chris Riley with higher quality recordings indicates that he did not say "a". I’m quite certain that we’ll have such [lunar] bases in our lifetime, somewhat like the Antarctic stations and similar scientific outposts, continually manned. The exciting part for me, as a pilot, was the landing on the moon … Walking on the lunar surface was very interesting, but it was something we looked on as reasonably safe and predictable. A century hence, 2000 may be viewed as quite a primitive period in human history. It’s something to hope for. … I am, and ever will be, a white-socks, pocket-protector, nerdy engineer — born under the second law of thermodynamics, steeped in the steam tables, in love with free-body diagrams, transformed by Laplace, and propelled by compressible flow. As an engineer, I take a substantial amount of pride in the accomplishments of my profession. Thank you, Mr. Chairman. I am in the position of a pilot without his checklist, so I’ll have to wing it a bit. … [Prior to the Apollo missions,] no one knew what kind of person could be persuaded to take the trip. Prisoners were suggested. Soldiers could be ordered. Photographers could take pictures — and they’re expendable. Doctors understood the limits of human physiology. Finally, both sides picked pilots. It's a great honor and privilege for us to be here representing not only the United States but men of peace of all nations, and with interests and the curiosity and with the vision for the future. Nixon: Hello, Neil and Buzz. I'm talking to you by telephone from the Oval Room at the White House, and this certainly has to be the most historic telephone call ever made from the White House. I just can't tell you how proud we all are of what you have done. For every American, this has to be the proudest day of our lives. And for people all over the world, I am sure that they, too, join with Americans in recognizing what an immense feat this is. Because of what you have done, the heavens have become a part of man's world. And as you talk to us from the Sea of Tranquility, it inspires us to redouble our efforts to bring peace and tranquility to Earth. For one priceless moment in the whole history of man, all the people on this Earth are truly one; one in their pride in what you have done, and one in our prayers that you will return safely to Earth. Armstrong: Thank you, Mr. President. It's a great honor and privilege for us to be here representing not only the United States but men of peace of all nations, and with interests and the curiosity and with the vision for the future. It's an honor for us to be able to participate here today. Nixon: And thank you very much and I look forward — all of us look forward to seeing you on the Hornet on Thursday. I thought, well. when I step off it's just going to be a little step — a step from there down to there — but then I thought about all those 400,000 people who had given me the opportunity to make that step and thought it's going to be a big something for all those folks and, indeed for a lot of others that weren't even involved in the project, so it was kind of a simple correlation. It's a brilliant surface in that sunlight. It's an interesting place to be. I recommend it. We were involved in doing what many thought to be impossible, putting humans on Earth’s moon. For The United States, the leading space faring nation for nearly half a century, to be without carriage to low Earth orbit and with no human exploration capability to go beyond Earth orbit for an indeterminate time into the future, destines our nation to become one of second or even third rate stature. While the President’s plan envisages humans traveling away from Earth and perhaps toward Mars at some time in the future, the lack of developed rockets and spacecraft will assure that ability will not be available for many years. It is true that we were cautious in our planning. There were many uncertainties about how well our Lunar module systems and our Pressure suit and backpack would match the engineering predictions in the hostile lunar environment. We were operating in a near perfect vacuum with the temperature well above 200 degrees Fahrenheit with the local gravity only one sixth that of Earth. That combination cannot be duplicated here on Earth, but we tried as best we could to test our equipment for those conditions. For example, because normal air conditioning is inadequate for lunar conditions, we were required to use cold water to cool the interior of our suits. We did not have any data to tell us how long the small water tank in our backpacks would suffice. NASA officials limited our surface working time to 2 and 3/4 hours on that first surface exploration to assure that we would not expire of hyperthermia. During my testimony (to the House Science and Technology Committee) in May I said, “Some question why Americans should return to the Moon. “After all,” they say “we have already been there.” I find that mystifying. It would be as if 16th century monarchs proclaimed that “we need not go to the New World, we have already been there.” Or as if President Thomas Jefferson announced in 1803 that Americans “need not go west of the Mississippi, the Lewis and Clark Expedition has already been there.” Americans have visited and examined 6 locations on Luna, varying in size from a suburban lot to a small township. That leaves more than 14 million square miles yet to explore. First On The Moon : A Voyage with Neil Armstrong, Michael Collins, Edwin E Aldrin, Jr. (1970) edited by Gene Farmer and Dora Jane Hamblin, p. 113, states of this: "Like many a quote which gets printed once and therefore enshrined in the libraries of all newspapers and magazines, this particular one was erroneous. Neil recalled having heard the quote, and he even recalled having repeated it once. He did not subscribe to its thesis, however, and he only quoted it so that he could disagree with it." 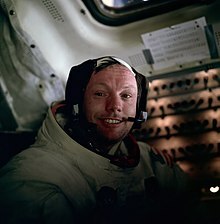 Neil Armstrong was also a reluctant American hero who always believed he was just doing his job. He served his Nation proudly, as a navy fighter pilot, test pilot, and astronaut. He remained an advocate of aviation and exploration throughout his life and never lost his boyhood wonder of these pursuits. As long as there are history books, Neil Armstrong will be included in them, remembered for taking humankind's first small step on a world beyond our own. [...] Besides being one of America's greatest explorers, Neil carried himself with a grace and humility that was an example to us all. When President Kennedy challenged the nation to send a human to the Moon, Neil Armstrong accepted without reservation. As we enter this next era of space exploration, we do so standing on the shoulders of Neil Armstrong. We mourn the passing of a friend, fellow astronaut and true American hero. He was the best, and I will miss him terribly. You got a bunch of guys about to turn blue. We're breathing again. Charlie Duke, capcom of mission control in Houston, after the announcement that the Eagle had landed. Over 30 seconds earlier a previous message from Houston had been an indication that there was 30 seconds of fuel left in the landing vehicle. Among the greatest of American heroes — not just of his time, but of all time. At few other moments has one person become the fulcrum of such weighty imperatives — to win a famous victory for America and vindicate a vast investment of national treasure, to penetrate a hostile frontier, to master a new technology, to navigate a harrowing descent to the unknown — all in the glare of rapt global attention. By the time he landed in the Sea of Tranquility, the country boy from Ohio had already spent most of his adult life in jobs where intensity of focus and the threat of violent death were part of his daily routine. He was used to all of that. It was, instead, the loss of privacy that appalled him. He loved to fly, and he loved his country, and in the name of those passions he was willing to risk not only his hide but a piece of his soul. Only a piece, however — a mere finger's worth — and no more. … Those who know him say he is a smart and intensely private, even shy, man determined to live life on his own terms despite having floated down that ladder into the public domain. Whether as an astronaut, naval combat aviator, test pilot, civil servant, engineer, absent-minded professor, gentleman farmer, businessman, civic booster, amateur musician, husband or father, Neil Armstrong has followed his own code.